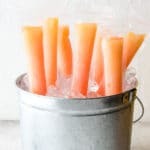 Frosty orange and pink Tequila Sunrise Freezer Pops are a great way for adults to take the heat out of a summer’s day. This easy recipe fills freezer pop bags to make an icy boozy treat! 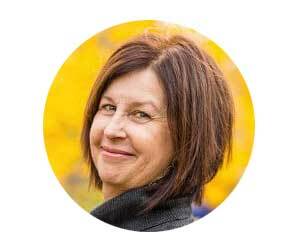 Summer’s heat begs for constant relief and hydration. In my house that means a freezer full of delicious popsicles, with many boozy choices for adults! 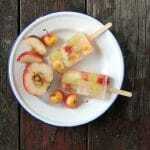 Something I started making last summer that has picked up recipe steam are freezer pops. Inspired by the frozen pops in a long slender bag my kids are awarded when getting a first place at swim meets, I couldn’t see why adults wouldn’t love them too. My current favorite? 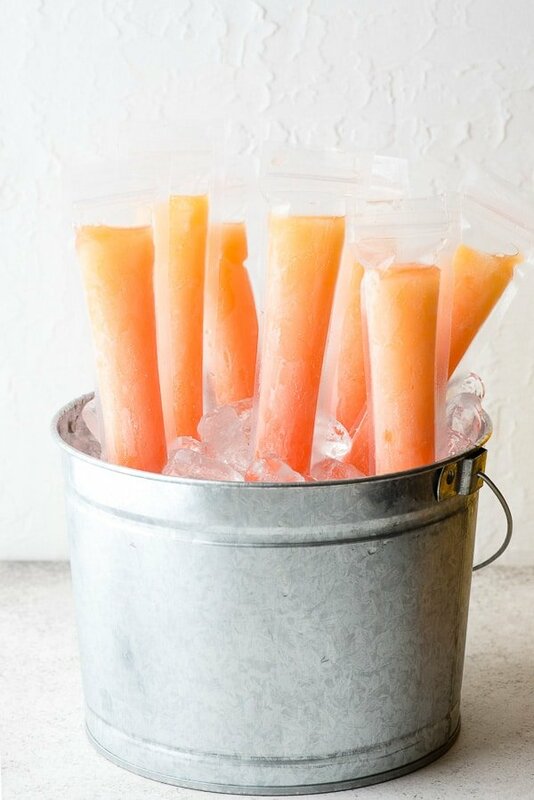 Tequila Sunrise Freezer Pops! There are a few things I love about making boozy freezer pops. 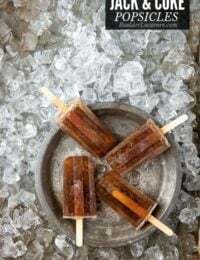 Cocktail popsicles freeze differently due to the alcohol content; they don’t freeze as hard as non-alcoholic popsicles, or freeze at all if too much liquor is included. Even when freezing hard the popsicles melt more quickly again due to the alcohol content. When made in freezer pop bags, if the pop melts more quickly no one cares, you can still drink it out of the bag! Light and fresh tequila sunrise popsicles are a perfect choice to take the heat out of a summer’s day. They are an easy 3-ingredient cocktail that transforms into a pretty freezer pop. A simple combination of tequila, orange juice and grenadine, along with a stemless maraschino cherry, are all that is needed to whip up these ‘poptails’. 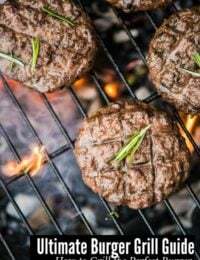 When certain ingredients are frozen their flavors can become dull, especially in the case of this recipe, since all orange juices are not equal in flavor depth. 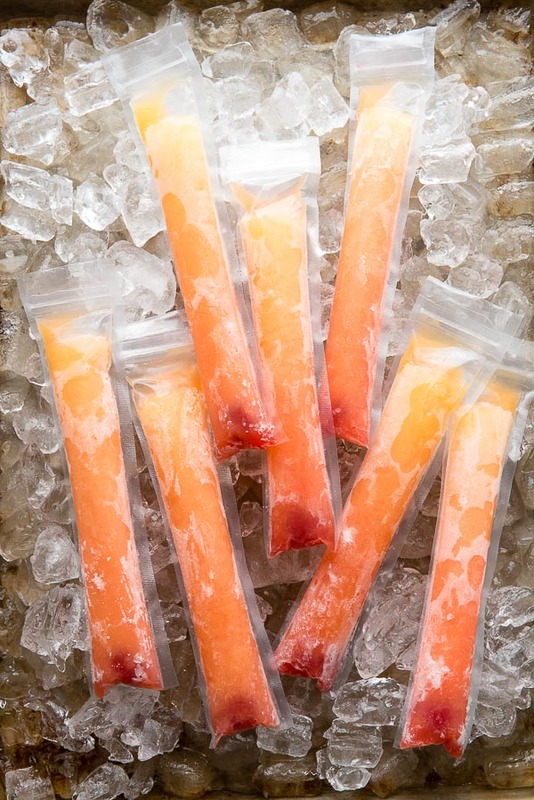 I add Nielsen-Massey Pure Orange Extract to the Tequila Sunrise Freezer Pops to keep the orange flavor bright. Nielsen-Massey Pure Orange Extract is made from the highest quality oranges and therefore has superior flavor in my experience. 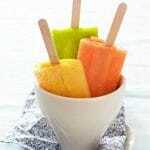 It’s in high use in my kitchen and I love the flavor addition to the tequila sunrise freezer pops! 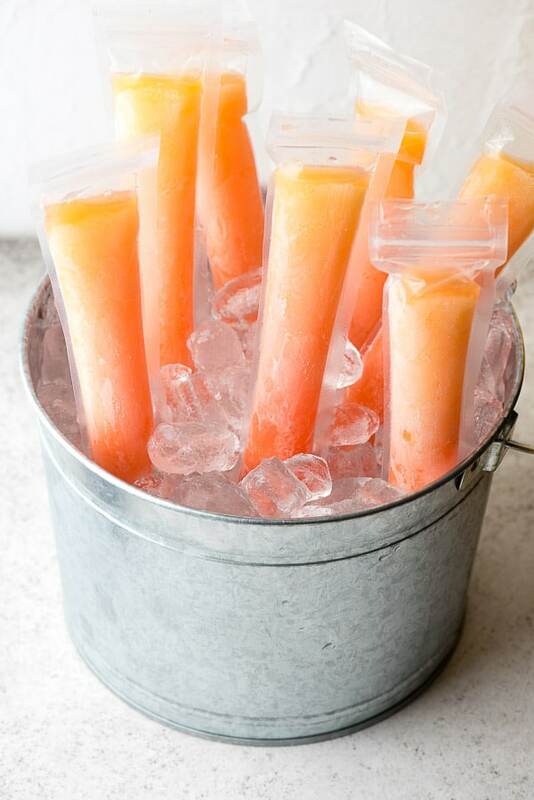 The tequila sunrise freezer pops can be made ‘per pop’ or in a batch. 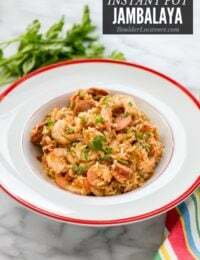 Ingredient amounts for each are included. When making a batch, be sure to fully mix all ingredients and stir between pouring into each pop bag to ensure the alcohol is well mixed with the other ingredients for even freezing. I recommend drizzling the grenadine into each individual bag to get the beautiful sunrise coloration. If you are in a hurry, it may be mixed into the other liquid and poured in as a whole. My favorite freezer pop bags are available online in packs of 36. They are essentially a long skinny plastic zipper bag. Frozen liquids expand so do not fill them more than the designated fill line; when the pop is frozen it will have expanded almost to the closure. To eat, cut just below the zipper closure. For more inspired recipes using Nielsen-Massey products follow them on Instagram, Facebook and Twitter. Nothing takes the edge off summer heat more than a frosty popsicle. 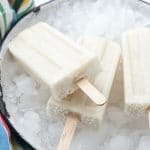 Homemade boozy pops are a fun way for adults to eat their cocktails! Making the pops in specially-designed affordable freezer bags can keep them frozen and ready without taking up too much room! Instructions per freezer pop and for a batch are included to meet your preparation needs. Add the maraschino cherry to the freezer pop bag and shake the bag to migrate the cherry to the very bottom. Place the freezer bag in a clean tall drinking glass. In a measuring cup combine the orange juice, tequila and Nielsen-Massey Pure Orange Extract and stir together. Place a funnel into the top of the freezer pop bag and pour the liquid into the bag. The liquid should reach the 'fill line' on the bag but no higher. Pour the grenadine through the funnel into the liquid. It will create a color gradient with more red toward the bottom. Freeze the freezer pop upright in the freezer until fully frozen. To eat: cut the top of the freezer pop bag just below the zipper seal and serve. Follow instruction steps 1 and 2 above, adding a cherry to each freezer pop bag and mixing the full batch of orange juice, tequila and orange extract in a large measuring up or bowl. Fill the bags in the same method as step 2 above, stirring the mixture between each pouring. (see note about the grenadine below). Adding the grenadine: to achieve the color gradient the grenadine should be measured and poured individually per freezer pop. If preferred it may be mixed into the orange juice, tequila, extract in batch step 2 and poured into the freezer pop bags. Freeze upright until frozen to retain color gradient and prevent seepage. I agree! Thanks for pinning! I’ve made freezer pops for the kids, but you’re rocking my world with these grown-up ones. It’s been so warm this week, I think they’d go over really well with my family and friends. What a nice treat for the older crowd at parties! They look really tasty. Is it bad that I so want to eat all of these? Seriously, these look and sound amazing!!! 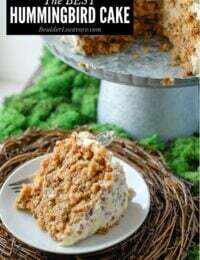 We so love having friends over and this would be a nice treat for them especially since the weather’s been extra warm these days. I love the idea of adding booze to frozen treats! It makes it more exciting! 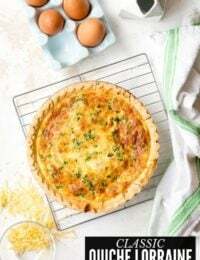 What’s great about these too is you can prepare them when you have time and have them ‘ready’ in the freezer! This is such a great idea for summer. I love how they look ombre! I have been wondering what the best way to make boozy popsicles is. Those freezer bags like that look perfect for it. I love this idea and it’s ideal for the summer. I can only imagine the fun I’ll have creating adult freezer pops. I love to drink Tequila Sunrises and this sounds like a delicious treat! I’m gonna definitely try making these for my husband and I this summer. This is a great way to get my vitamin C. I will keep this in mind for fun at my next adult barbecue. 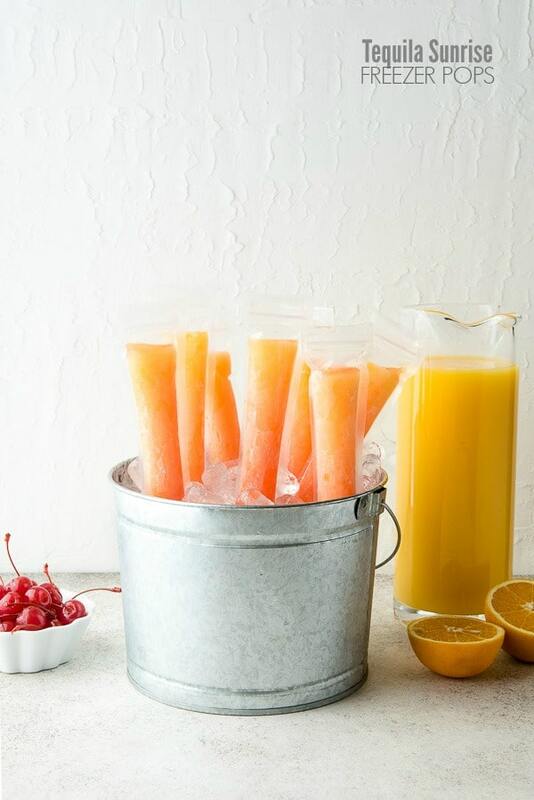 Those ice pops are a great way to get your vitamin C. When I have guests over I know they will love this cool treat. These would be great for an adult party. I know a few poeple who would love them. Oh these are fun and I’m a huge fan of Tequila Sunrises. Using the orange extract was a good idea. 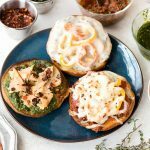 These would definitely be perfect for guests at an outdoor get-together! I just bought some bags so I could DIY some ice pops and have been wondering where to start with them, this sounds like such a great starting point. I love Tequila Sunrises and making them into freezer pops is a great idea. 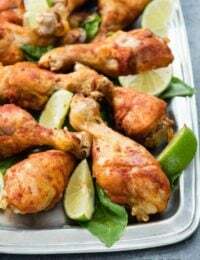 I need to make these for my next girls day. That is amazing! This is the perfect thing for a hot Georgia day when we’re all out back enjoying a good barbecue.